Con on the Cob 2008: Day 4 – WEGS | Kris Johnson's Blog…sort of. Character generation in WEGS takes all of ten minutes: roll your stats, select a race and class, calculate your derived stats and that’s it; you’re done. The character sheet is single-sided and there’s no equipment to buy; if you’re a warrior, you’ve got a melee weapon, if you’re a ranger you’ve got a ranged weapon and so on. “What’s my motivation?” I asked. The game started as a single-player demo, but by the time I was ready to place my figure on the map I had been joined by three others: a mage, a warrior and a sage. The first two were played by experienced “Wegshogs”, the last by another newbie. From the first round, I found myself harassed by a ranger in the castle’s eastern tower (assuming we were assaulting from the south), and we traded shots back and forth for much of the game until I was able to put him down and turn my bow toward the array of baddies that had poured out of the castle gate. Once we found our groove, the gameplay was quick and brutal. Heroes and monsters exchanged blows (or spells, or arrows) back and forth in rapid succession, but soon we found ourselves up to our eyeballs in teeth and claws. At the beginning of the game (when it looked as though I’d be the only player) Larry had asked me whether I’d like to play Mild, Medium or Nasty. An hour later I discovered that Nasty does, indeed, live up to its name. Heroes are very tough to kill in WEGS, but these monsters were out to demonstrate that “tough to kill” and “impossible to kill” are two very different things. Our elf warrior was on the brink of death, burning Phew! points to stay in the game, ((This stat allows a character who has lost all of his or her wound points to narrowly escape death. Phew!)) our mage had seen the ugly end of a Hill Giant’s club and had only two wound points remaining between her and a pine box, and our ranger could probably have hired himself out as a professional pincushion. Even our wily little gnobbit sage had taken a few hits. Things looked pretty grim. It was a close contest, but in the end the monsters just couldn’t wring that last bit of life from the heroes. 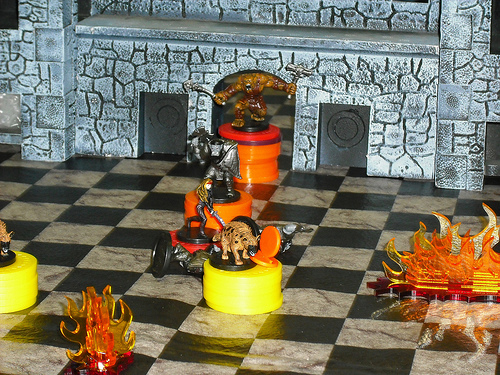 The game, which was essentially a single combat encounter, had lasted nearly two hours. That’s two hours of dice-rolling, number-crunching, hack and slash fun. Just the sort of thing to provide a counterpoint to the four and a half hour story game from the night before. WEGS isn’t going to win any accolades from the story gaming crowd, but it’s not meant to; it is an unapologetic return to the early days of pen and paper adventures, when the “role” in “role-playing game” was often spelled R-O-L-L. I had been curious about this game and really wanted to jump into a demo. Just couldn’t find the time. Glad you were able to take part. @Jahnoth — If I was a miniatures guy, I’d probably buy WEGS; it would be a fantastic pick-up game for those times when someone doesn’t show up for your regular game or you just need a little break from a big campaign. Unfortunately, at this point, the investment I’d have to make in order to be prepped to play WEGS is kind of daunting. Thanks for this great write-up. Excellent photos and notes, too! That was a pretty brutal encounter, but next time you play I’ll turn up the heat a notch (like adding spoint-sucking giant toads). You only saw a few ways the Arks can spring leaks in WEGS. Thanks for jumping into the fray! ps – regarding your comment above about being prepped to play/run WEGS. i think you’re already there based on your notes. the same rules that apply to players, apply to the GM (the Kreator in WEGS); the Kreator just plays on a grander scale (plays multi-characters). WEGS was built for easy access from both sides of the table (players and GM). @Larry — Thanks for swinging by my little blog and taking the time to comment. Technically, that 77 Ranger could have been using the same Ranger skills as you. Level 66, 77 and 88 are Master Minions and possess Ark-level capabilities. @Larry — You mentioned at the end of the game that some players actually take the tower in order to get at the Ranger. I’m very curious as to how WEGS handles elevation. My two cons in the past couple of years have been Origins and Con on the Cob, so if you’re at either of them in 2009 I’ll be sure to track you down. For ascending the tower, we just assume it’s a one inning action. You could say that it counts as 20 Move or so, then divide that by the Ark’s Move score for total innings, etc. Depends on how much number crunching you want to throw in. We tend to shy away from that in demos, though. GameWick will be at Origins 2009 – so jump into one of our game there! We’d like to come back to the Cob, too, but we’ll have to see how the cards fall. My fingers got itchy for some reason, then I see you’re talking about me, Kris. And I see the hint, but… I do not own WEGS. Not sure what to do about that. Perhaps Larry could hook me up. And Larry, you’ll come back. 🙂 They always come back. I love the simplified gameplay in the WEGS system. Sometimes I just need to get my “storm the castle and kill the monsters” fix. Larry and Sue(that’s his wife- I believe she played the mage in our game) are a lot of fun. If you enjoyed the game at Con on the Cob, it will be even better at Origins. They had a pretty good following there last year,so the game tables can get pretty full-that makes for a loud rollicking game with lots of joking and laughing involved. @Jahnoth — It wasn’t my intent to suggest that you buy the game; just that if someone else in the group were to pick it up we could probably borrow your minis and mat to play. 🙂 Christmas is coming, after all. @Jahnoth – Yeah, i’m sensing that I’ve been bitten by the Cob. We had a good time that’s for sure. First time at a con is always the hardest! Can’t wait for Origins now!